Leanne bakes: MacBook Air Giveaway! 'Tis the season to be jolly... and 'tis the season to be giving away lots of free stuff, too! 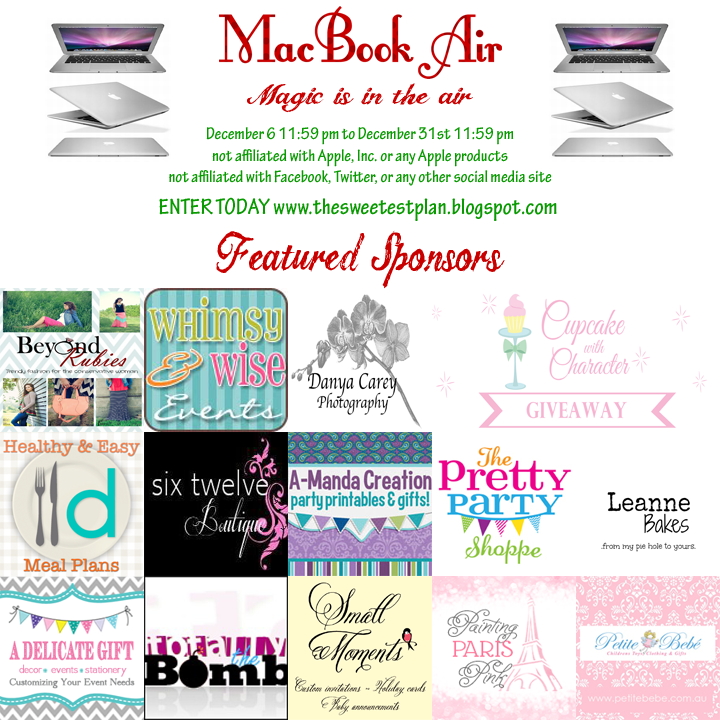 Cupcake With Character has teamed up with over 30 awesome shops and bloggers, including me, to give away a FREE MacBook Air! A complete list of sponsors is in the giveaway tool below. Spread the holiday cheer by taking a minute to drop by and visit our featured sponsors pages and show them some love! Rules: Contest is open from December 6, 2013 at 11:59 PM PST to December 31, 2013 at 11:59 PM PST. The winner will be chosen randomly through the Giveaway Tools form. Giveaway is open worldwide to all participants 18 years of age and older. Void where prohibited by law. Winner must comply with all laws in their Country. Winner will be asked a skill test question upon claiming prize. The winner will have 24 hours to claim their prize. Should they not claim their prize within this time, another winner will be selected. Please ensure that the email cupcakewithcharacter [at] gmail [dot] com is on your "safe list"!